Need a really good reason to travel to NYC this autumn? 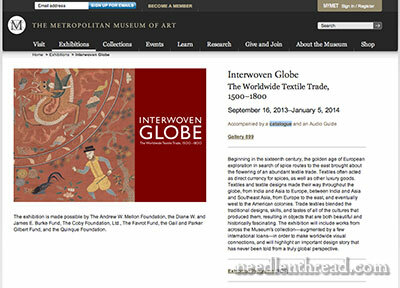 How about the Metropolitan Museum’s exhibition, Interwoven Globe? 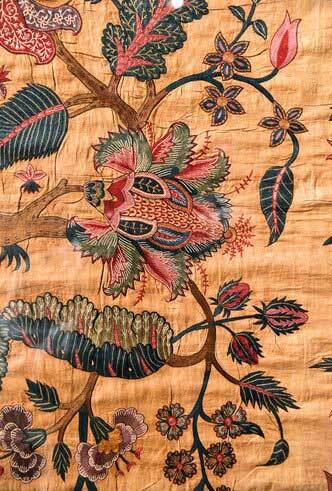 Interwoven Globe: The World Textile Trade 1500 – 1800 opens September 16, 2013, and runs through January 5, 2014. It traces the textile trade from the 16th century through the 19th century, all around the continents, and features all kinds of textiles, including elaborate embroideries. The exhibition promises to be a fabulous one! And I love NYC in the autumn and winter! But for those who can’t go, never fear – there is, as usual, a gorgeous catalog available. 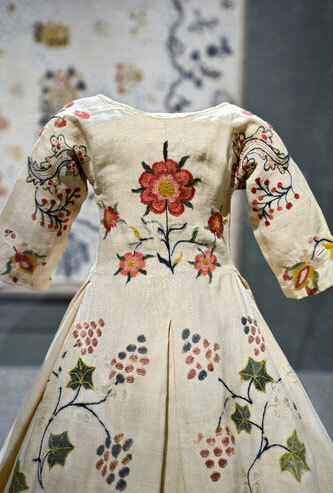 Many of the textiles in the exhibition that belong to the Met have not been shown before. I love it when things like this are made available for the public to view. It’s a rare opportunity to revel in the history of textiles. Anyone up for a road trip?! September 30, 2009 Tapestry Woven from Spider Silk! January 17, 2015 Connecting with Stitchers from Everywhere! September 24, 2010 Koala Conventions – Coming to America! The catalog sells for $65 from the met, but for $39 from amazon.com. It is a 360-page hardcover. I’m Going!! Thanks for the information, Mary. You made my day (again)! How I wish to see that! For anyone else who was entranced by the first photo, here is a link to the Met’s info on the dress: http://shar.es/iZ6Lx (The web address looks weird because the Met uses a service called “Share This” to link to their pages). There are 16 excellent photos, high enough quality to see the wool stitches on the linen ground. It is so wonderful to look out my window at the Seattle skyline while visiting a museum in New York! Oh, thank you! I was wondering where it came from! Boy, I’d love to go see this! My daughter lives about 3 hours from NYC. Maybe I could combine it with a visit with her. Fall in NY is wonderful! Have you heard of the blog called “Plays With Needles” by Susan Elliott? This past few days she’s been sharing photos of her trip to the Burrell Collection in Glasgow. She has lots of amazing close up photos of this needlework collection. I’ve been constantly saying to myself, “Mary Corbet would love this.” So, I just had to share it with you. Oh, Yes – I follow Susan’s blog! Absolutely love it – and her photography skills! I saw this exhibit today and it did not disappoint. GO if you can! It really is extraordinary! It would be grand fun to have you there to give us perspective on what we were seeing! Last week I received my Met News Letter and promptly ordered my copy. I signed up to several museums to receive newsletters about these type of catalogues. Not going to miss out again. From what you have shown it seems to be another lovely edition. As I age it is becoming a matter of slowing sewing and speeding reading. Alas Mary to far for me to have a road trip from here. I could surprise my brother in law. Now that gives me food for thought?!?! He lives in Rhode Island. You little piece on the catalogue has built the excitement. Thanks Mary love all your jottings. It is the last thing I read before bed. Oh wow, Mary, that look fabulous. But it would take a little more than a road trip for me to get there, lol. Not even sure if the exchequer will stand the price of the catalogue, but I’ll sure try. It looks superb too. Lucky you, being able to get to all these wonderful exhibitions. But wonderful you, for letting us know that they are on and something about them. Top of the class. Oh, GOOD idea!! Perfect… and a good time of the year for a visit! Well I did it, I ordered it – from Book Depository in UK. A few dollars less than the Met and free postage to Australia made it a much more attractive proposition. I am forcing myself to ignore it until I have dealt with all the emails that have built up while we were experiencing high winds etc that play havoc with our broadband reception. But, I have to tell you that the cover on the hardback version is beautiful – not just the pattern but it is actual fabric-y stuff. So if you are thinking of buying the book, consider spending the extra and having the h/b, it is worth it. Next Next post: Needlepainting Class Winner Announced!